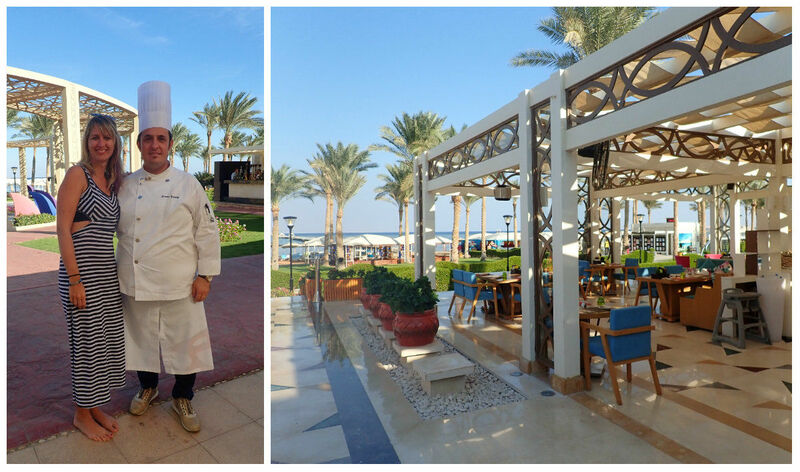 Great food and amazing snorkeling directly at the hotel’s beach: those are highlights of my stay at Rixos Seagate Sharm El Sheikh. Without any doubt, winter is my least favorite season of the year. Once the temperatures drop, daylight is cut short, and the first snowfall occurs, there is only one thing that I desire: an escape to somewhere sunny and warm. And this time, I really did it! Together with my boyfriend, we took off to Egypt to enjoy some sunshine and relax on the beach. 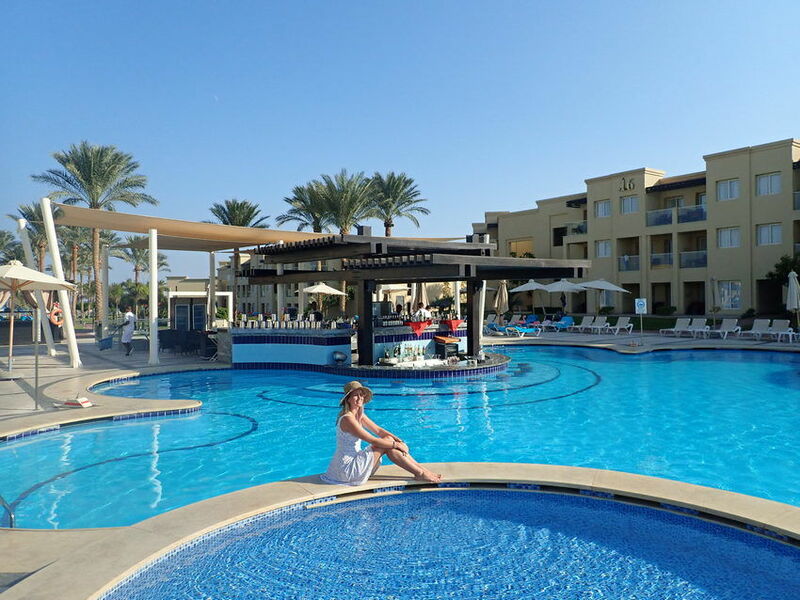 For one entire week, we stayed at an idyllic resort called Rixos Seagate Sharm El Sheikh. There are definitely a lot of 5-star hotels in Sharm El Sheikh. Our choice was pretty spontaneous; we only spent one hour before deciding which would be the best hotel in Sharm El Sheikh for us. And we ended up pretty lucky; I could not have imagined a better place than Rixos Seagate Sharm to spend our winter holidays. It’s really worth recommending. 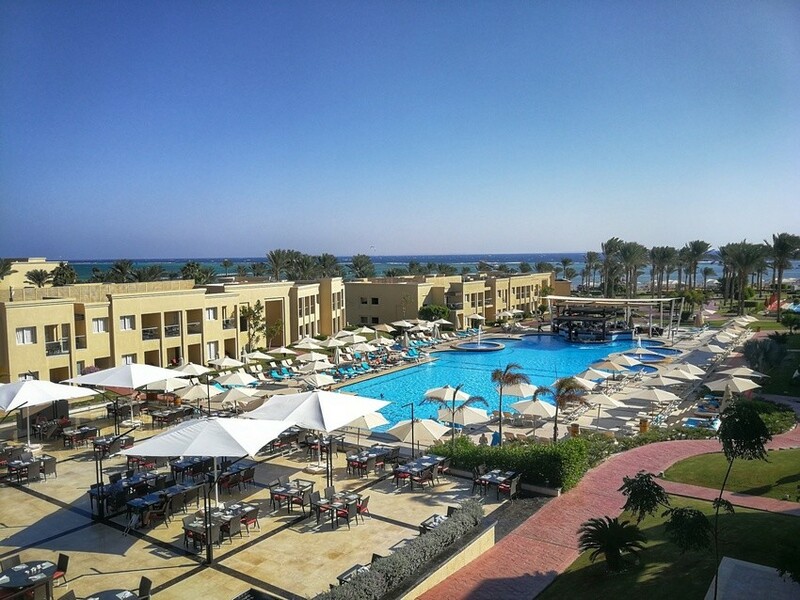 Rixos Seagate Sharm is located just a short drive from the airport at Sharm El Sheikh. You can reach the hotel in 20 minutes (as long as your shuttle bus doesn’t have many other stops at other hotels along the way, which some of the travel agencies do during the high season). Getting there for us was pretty convenient. There are several other hotels neighboring Rixos Seagate, so it’s possible to have a walk on the beach in either direction and see other resorts. Based on their beach facilities, none of them compared to Rixos. Rixos Seagate Sharm El Sheikh spans a large area (it is definitely one of the biggest resorts you can find) and offers a staggering 652 rooms and villas. Due to its size, it’s important what end of the hotel you end up in. Our location was quite good: Cluster 14, which was rather near the beach and literally next to the main restaurant. Our room was situated on the third floor. It was spacious and modern, with a spotlessly clean bathroom. The room service was excellent, with soft drinks, wine and beer being added to our minibar daily (sometimes even twice). Our room featured a small balcony, providing us with a view of the swimming pool and a glimpse of the sea as well. The resort is very pretty and well maintained, so it is amazing to see it from above. As I mentioned above, the resort is pretty huge. When it comes to facilities, you can really find anything you need there. As for the teenager club and kids club, I will disregard them in this review, as we were there as a couple, so we didn’t use them a lot (apart of playing table tennis in the Teenager club once). All top hotels in Sharm El Sheikh feature their own private beach, and Rixos Seagate Sharm is no exception. We definitely came for the beach and sunshine, and we really made the best use of it. Despite being clean and comfortable, the beach at Rixos unfortunately isn’t one of the hotels best features. I must honestly say I was little disappointed. You might not notice it at first sight, but once you try to enter the water, you will know. The water is very shallow; even if you walk further, the water will be no higher than your ankles, even as far out as 500 meters. Despite its location in the shallow bay, the Rixos has tried to make the best of its beach by building a long seabridge spanning far into the sea. It is very photogenic, and there is a coral reef at the end of it. However, you have to deal with the long walk if you really want to go for a swim in the sea. One funny thing I noticed: They often mention that the seabridge is 850 meters long, but in reality, I learned it is longer than 1000 meters. We spent a lot of time at the beach every day, but I must say that having have to part from Mathias for such a long time and walk so far just to go swimming wasn’t really too romantic. There are several swimming pools at Rixos Seagate, all spotlessly clean and featuring warm water. 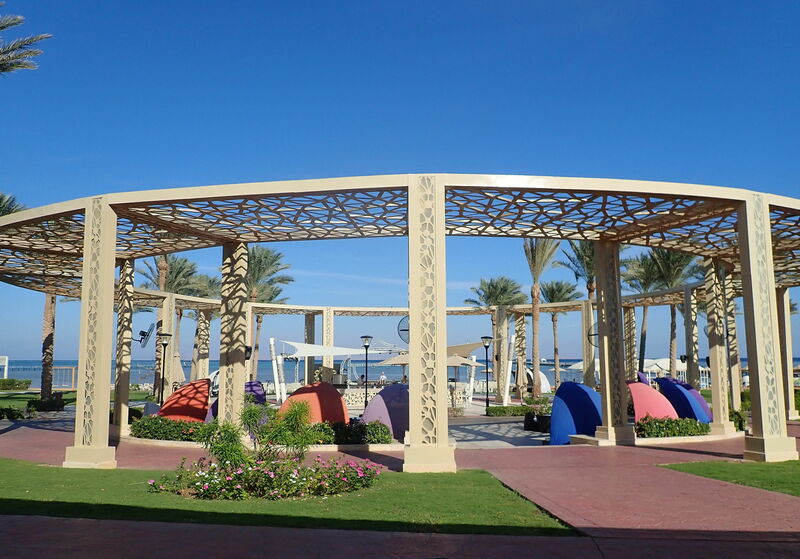 There are plenty of sun loungers and various kinds of seating, so you can always find a great place to sit back. Although I spent the majority of my time on the beach, I loved to go swimming in the pool in the morning. It is supposed to be “open” from 8 am, but as long as you don’t make much noise, they don’t seem to mind if you swim earlier. In the evening, on the other hand, they like to close up the pool pretty early. From what I understood, the pools were supposed to be open until 7 pm, so we always wanted to go there right after there was no more sun on the beach, but they always started to clean around 5-6pm and asked us to leave. The food is quite amazing at Rixos; it tastes excellent and there is lot of variety, so in fact you can eat a different thing every day. 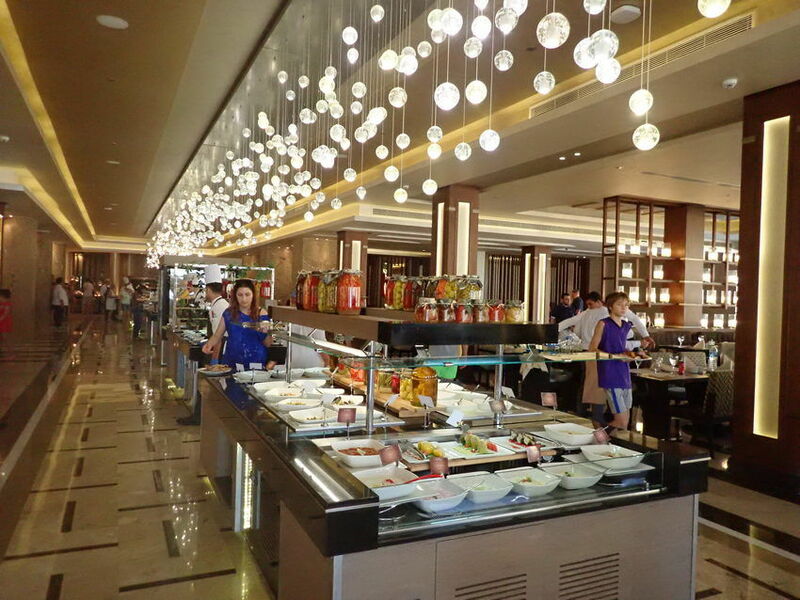 We ate at the main buffet restaurant the most, and we actually never got bored of it. Sometimes, we tried the a la carte restaurant or one of their other special restaurants. 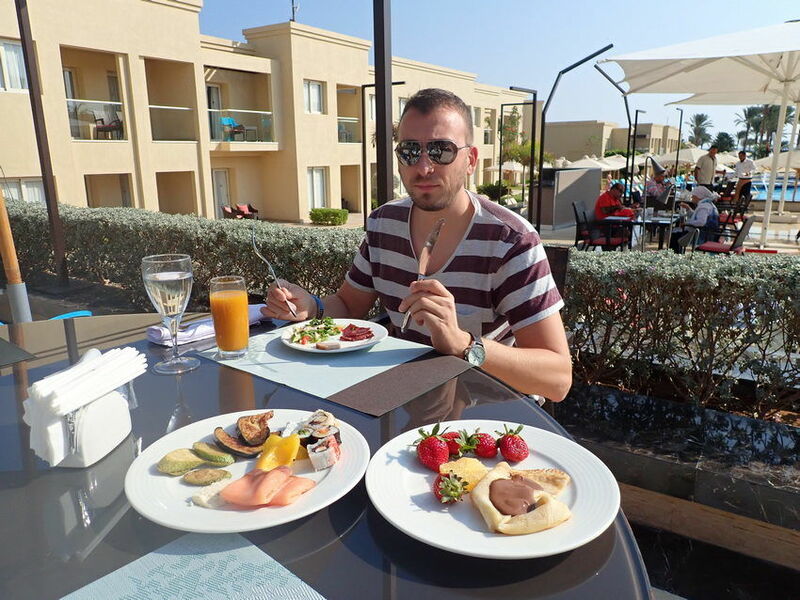 I think the food alone makes Rixos Seagate one of the best hotels in Sharm El Sheikh. Just in case you experience a cooler of windier day, the spa at Rixos makes a great back-up plan to the beach. It is not a common feature, even at 5-star hotels in Sharm El Sheikh. So it needs to be enjoyed! In winter, days are little shorter in Egypt. During our stay, the sunset took place around 5 pm, so you still have a plenty of the time to do things after that. On one of the evenings, we tested the spa out and quite liked it. They have a sauna, steam room, whirlpool, and nicely designed relaxation rooms. For an extra charge, you can order a massage or a hammam treatment. Hands up: who has heard of people having stomach issues during their holiday in Egypt? This problem, originating from the local water (which is also used for washing fruits and vegetables), is one of the most common problems visitors experience in Egypt. Well, this of course didn’t happen to us at Rixos Seagate. We actually met a chef who explained to us that they check all of their fruits and vegetable very carefully, and then instead of manual washing, they clean them all by machine. Each piece is cleaned separately before it can go onto the table at Rixos Seagate. Overall, we truly enjoyed the food at Rixos, and the highlight was their seafood menu, including lobster. Can you possibly eat anything better??? While staying at the Rixos Seagate, you don’t have to plan a special trip just to experience snorkeling; its right there for you. An amazing coral reef is to be found at the end of the sea bridge, with snorkeling equipment available at no extra charge. 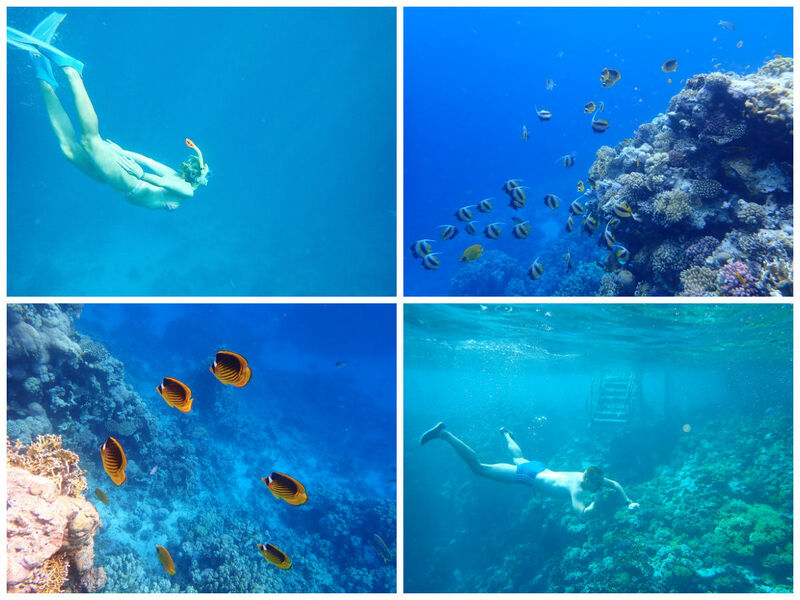 Snorkeling is one of the most amazing things you can do in Egypt. It is like discovering a completely different world. There are sea creatures of all shapes, colors, and sizes to admire. I loved snorkeling at Rixos, although sometimes it was too windy and you actually can’t go in when a red flag is displayed. What they really do well at Rixos is the way they approach guests. Everyone is very friendly and shoes genuine hospitality, starting from reception, all the way to the managers. They are extremely attentive to the guests’ needs. We felt very welcome and found the restaurant manager as well as the chef often were often chatting merrily with the guests, ensuring they were having an excellent experience. Although we loved our stay at Rixos Seagate, there is no such a thing as the perfect resort for everyone. Here you have to be able to compromise with the beach (shallow water, swimming only possible from the long bridge) and you also have to be okay with the size of the resort (it is rather big and things are quite far away from each other). Apart from this, we had two negative experiences that I think are in much need of improvement. 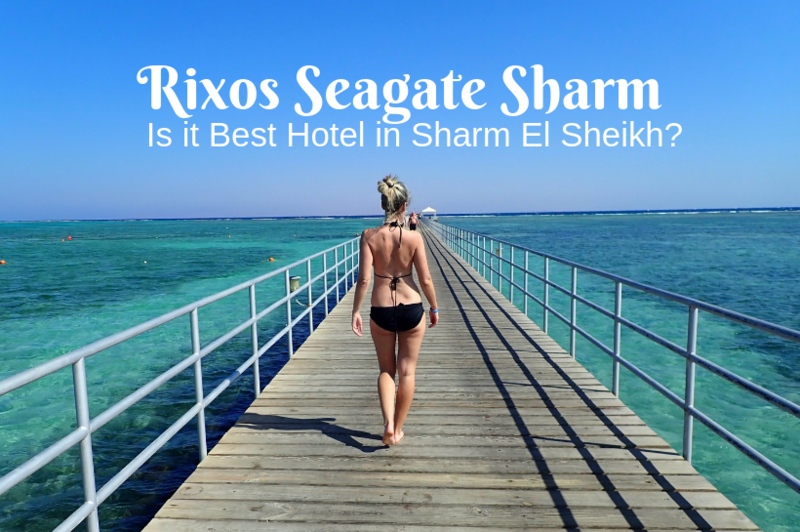 What could have been better at Rixos Seagate Sharm El Sheikh? As for the cartoons, it is a good thing to have a program and activities when visiting with kids or teenagers. However, as a 30-year-old holiday maker who is mainly looking for rest and sunshine, I didn’t appreciate the loud music and TV programs at the swimming pool (and sometimes beach) during the day. Luckily, the activity center was located in another part of the resort. The swimming pool under our windows was more or less quiet most of the time, but we could still hear the music from it sometimes. I would suggest keeping to evening programs (I don’t mind watching some performances on the stage, which by the included some amazing dancing performances), but I would cut the loud music during the day. If you want to find activities, you can still find them, but let’s just leave everyone else in peace…it’s a holiday after all. This has to more to do with our particular experience rather characteristics of the hotel, but in order to provide an honest review, I can’t skip this. On our last day, there was an unpleasant surprise to deal with: we were expected to check out very early (I think it was 2pm), more than 12 hours before our flight. Now if you have traveled before to Egypt, you know that most all-inclusive packages are planned so that often an overnight journey is always somehow included. In all other hotels I’ve stayed at in Egypt, the standard was to keep the guests in the room until their pick up to the airport. At Rixos Seagate, however, there is a fee for late checkout, then you can stay until 8pm. If you pay a much higher fee, you can stay beyond midnight. I don’t remember the exact fees anymore, but after we paid for our all-inclusive stay for 7 days, it sounded rather ridiculous. To add to this, we actually learned about this around 7pm, when the reception called and was wondering how come we hadn’t checked out yet. After a long discussion with the manager, we didn’t end up paying for this extra stay, but it also meant hanging around without privacy for several hours before departure. It was unfortunate to have the ending rather spoiled. Disclosure: There was no partnership with the hotel: we booked our holiday and paid the full price for the package (It wasn’t cheap!) I put in the effort to write this review for the sake of recommending it to my readers. This hotel is too beautiful not to share! Rixos Seagate Sharm El Sheikh is one of the best 5-star hotels in Sharm El Sheikh. It is spotlessly clean and very pretty, making guests feel like they have just landed in paradise. The resort is rather big, providing every kind of facility you could need, including an amazing spa. The highlights of the experience for us were amazing food, both in terms of taste and variety. The service provided is outstanding, and all employees are very friendly and attentive to guests. 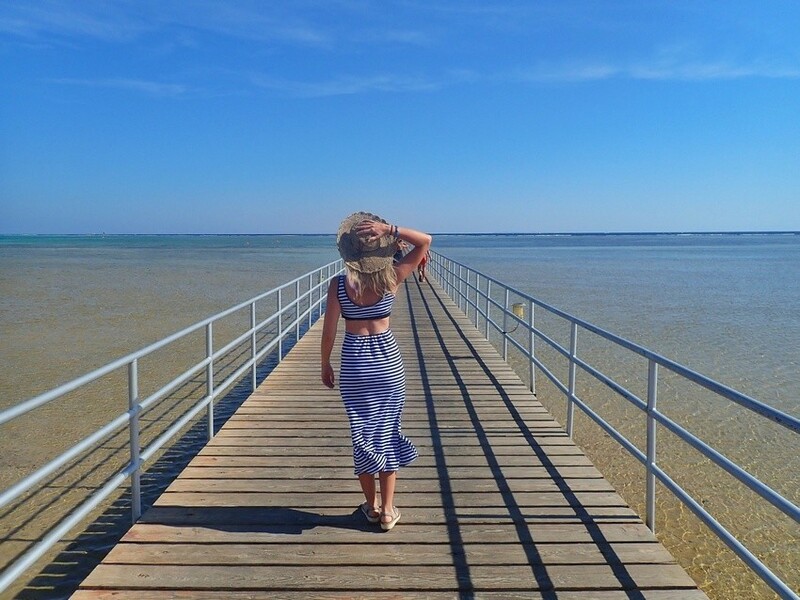 Despite the weaknesses, especially the beach with shallow water and long bridge to provide swimming, it makes for an amazing place to enjoy a holiday. I am happy to recommend it to others. We will be back!